It wasn’t 100 points and certainly wasn’t pretty, but it was enough to get the job done. No. 17 Miami forced 34 Boston College turnovers and was powered by three of its starting guards to defeat the Eagles 58-51 on Sunday afternoon in the Watsco Center. The Canes (16-5, 5-4 ACC) pulled through a late-game scare. Despite leading by as many as 14 points, UM allowed Boston College (8-14, 1-8 ACC) to go on a 13-3 run to take the lead with just over three minutes left in the contest. That is when the Miami defense came alive. Junior forward Keyanna “Keke” Harris stole the ball on back-to-back possessions, and senior guard Jessica Thomas scored four-straight points to ultimately put the game out of reach. During one of the final timeouts, Head Coach Katie Meier called Harris over and pulled her in for a hug. The Hurricanes pulled out the full-court press early, and it was effective. Miami forced a season-high 34 turnovers for Boston College, 19 of which were Canes’ steals off sloppy passes. 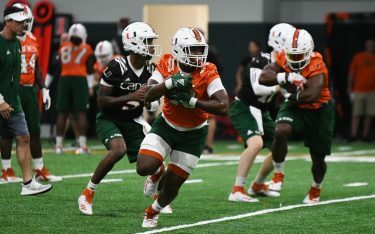 After an offensive explosion against North Carolina just three days ago that resulted in 100 points, Miami struggled shooting – hitting just 33 percent from the field. 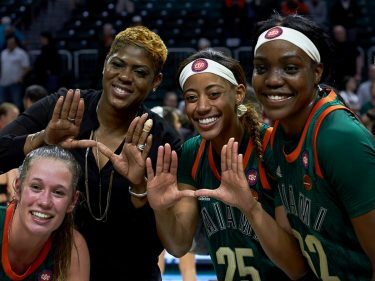 However, the Hurricanes benefitted from the scoring by guards Thomas, Laura Cornelius and Adrienne Motley – who returned to the lineup after a one-game absence. They combined to put up 39 points and hit five three-pointers. UM struggled with turnovers of its own, coughing up 27 of them. Boston College, which had lost seven-straight games going into the matchup, was unable to get consistent offensive production from anyone outside of sophomore center Mariella Fasoula, who tallied her fifth-straight game of 20-plus points with 21 to lead the Eagles. Eagles guard Kelly Hughes, all-time leader in three-pointers in school history, scored just six. The Hurricanes went on a 14-2 run to end the first half but did not come out with the same production in the second period. They were outscored 26-14 in the paint. Miami looks to get its third-straight win when it travels to play Wake Forest at 7 p.m. on Thursday in Winston-Salem, North Carolina.